It's a Massive Street Party with a Spiritual Meaning! 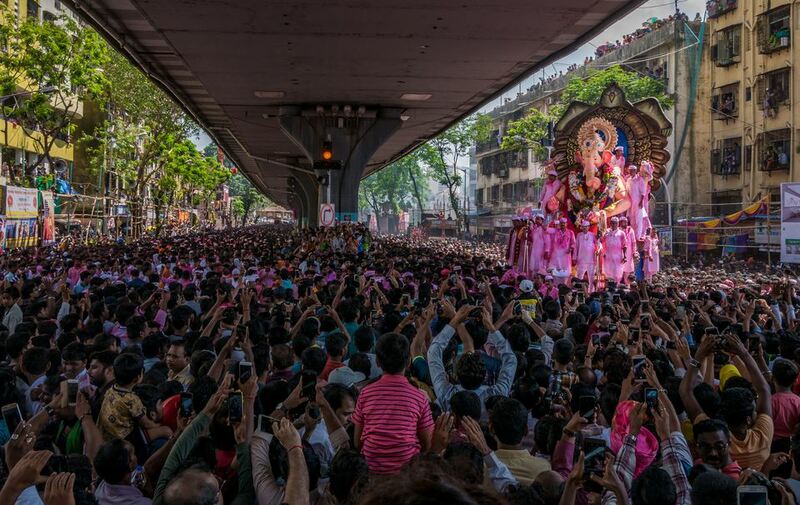 Mumbai's Ganesh Chaturthi festival is the biggest celebration in the city. If you want to experience in Indian festival on a grand scale, this is it! It's a massive street party with a special spiritual meaning. How did the festival become so popular in Mumbai though? Ganesh Chaturthi originated as a public festival in the city of Pune, about four hours away, more than 125 years ago. Although there is debate over who started it there (Sardar Krishnaji Khasgiwale, freedom fighter Bhausaheb Rangari or freedom fighter Lokmanya Tilak), its main purpose was to bring people of different classes and castes together to unite them against the British rule. Lord Ganesh, as the much loved remover of obstacles and god for everybody, served this purpose. The tradition has carried on, and nowadays there's great competition among local communities to put on the biggest and best displays of statues of Lord Ganesh. Ichhapurti Ganesh Mandal, near Chhatrapati Shivaji Terminus in the Fort district. Fort Vibhag Ganesh Utsav Mandal, opposite the GPO in the Fort district. Chinchpokli Chintamani Sarvajanik Utsav Mandal, near the east side of Chinchpokli railway station on the Central line. Rangari Badak Chawl Mandal, near the east side of Chinchpokli railway station on the Central line. Kamatchawl Sarvajanik Ganeshotsav Mandal, Opposite Zaoba Ram Mandir, Thakurdwar Naka, Thakurdwar. (This one is one of the oldest Ganesh mandals in Mumbai). Akhil, Anjeerwadi Mandal, located at Dr. Mascarenhas Road, Mazgaon. Girgaum, known as the heart of old Mumbai, is a must-visit place during the festival (and especially on the last day of immersions). It's divided into small neighborhoods called "wadis". Some of the significant idols in that area are the ones at Khotachiwadi heritage precinct, Fanaswadi, and Jitekarwadi. There's also a large eco-friendly Ganesh idol, known as the Girgaumcharaja (King of Girgaum) at Nikadwari Lane. Visit the very old Akhil Mugbhat Ganesh in Mugbhat Lane for a dose of culture. Don't be concerned that you might not be able to find the festival. There are statues in streets all over the city. In fact, it's hard not to come across a display of Lord Ganesh! If you're in Mumbai up to three months before the festival, you can see the Ganesh statues being made. Grand Mumbai Tours offers daily Ganesh festival tours. The tour on the last day is a highly recommended special tour of the Ganesh idol immersions. Mumbai Magic runs a range of tours daily during the festival. These include visits to the idol workshops to see people buy and take home statues, visits to the public displays of the statues, and sampling of sweets. Email deepa@mumbaimagic.com to find out the options. You can either join an existing tour or take a custom private tour. Reality Tours and Travel conduct super interesting and informative Ganesh Chaturthi tours. The tours visit a public Ganesh display in the Dharavi slum potter's colony and a number of family homes in Dharavi, as well as the community that originally started the Ganesh festival. It concludes at Girgaum Chowpatty, where the immersions of the idols take place. The cost is 1,200 rupees per person. If you'd like to be a part of a Maharashtrian household's private festival celebrations, join Break-Away's Spirit behind Mumbai's Favourite God tour. You'll get to have a meal with a local family and participate in their worship of the idol. The tour also visits idol makers and a public Ganesh display. The festival ends with the parading and immersion of the statues into a body of water, usually the ocean in Mumbai. Traffic gets a bit crazy on immersion days as many people head for the beaches and roads are blocked off due to processions. Hence, it's a good idea to stay somewhere close to the immersion points. "Ganpati Bappa Moriya, Pudcha varshi loukar ya" - Hail Lord Ganpati, come soon again next year.